On Friday, 1 September, we had a light breakfast before boarding the bus at 8 a.m. It was pleasantly cool this morning. Leaving the dry and brown Aegean coast on the east side of Greece, we headed over the mountains toward the Ionic Sea on the west coast. Passing through the town of Tripoli, we reached Megalopolis, where we stopped briefly near the town square about 10 o'clock. Jeannie drank a Coke and Michael ate some gelato (Italian ice cream). We found the west side of the Peloponnesus to be green, probably related to the higher humidity which made it seem unpleasantly hot. At noon we arrived at Olympia, named in honor of Mount Olympus, legendary home of the gods in northern Greece on the country's highest peak. Here we went first to the museum. The artifacts recovered from Olympia seem better preserved than most objects of that period, apparently due to being buried by floods. Having a tour guide with a college degree in history and archeology prompted one person in our group to tell her that it seemed we were on a school field trip. Indeed, our guide spoke very knowledgeably, as well as very enthusiastically, about the subjects. It was about 2:30 before we had the opportunity to get lunch at our hotel near Olympia. After we had a rest period, we were transported to the archeological site at 4 p.m. 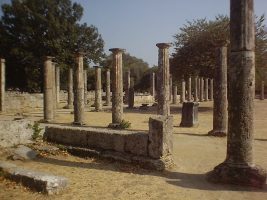 The first Olympic games were held here in August 776 B.C. and then every 4 years for a millennium. 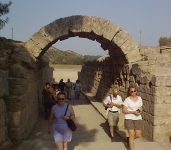 For about 2 hours we walked about the ruins with stories and lessons from Despina, our sweet guide. 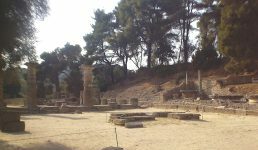 We saw the ancient temple of Zeus with huge columns which all fell down during an earthquake in the sixth century. This temple was built mostly from limestone that is loaded with fossilized seashells. For the temple to have looked good, the stone had to be covered with plaster. There is a falling-down Byzantine church built over the workshop of Phidias, the artist who created on this site one of the "seven wonders of the ancient world," a giant gold and ivory statue of Zeus. It was destroyed or lost long ago. With the 2000 Olympics starting very soon in Sydney, Australia, it was especially inspiring to see the spot where the Olympic torch had been lit by the sun at the Temple of Hera (above). On our way back to our hotel we stopped in Olympia about 6 p.m.. Though this is a small town, it has lots of souvenir shops. Since we had only 45 minutes there, 9 of the 10 in our group returned after we ate supper. With most of us wanting to go back into town, our bus driver drove us there, then showed us where to catch a taxi for the return. We found a skirt for Jeannie to wear tomorrow to visit a church, some gelati that was almost as good as in Italy, some souvenirs for Michael's co-workers, and an Internet cafe. Upon checking our e-mail, we disappointedly discovered that a message announcing our safe arrival, sent from Athens two days previous, hadn't gone through. After re-sending it using the proper syntax, we e-mailed separate messages to our kids. We returned to the hotel at 10:45. By this point it seemed we had been in Greece for a week. It's so amazing that we had seen and learned so much in two days.